Drones instantly conjure up negative ideas - the controversial act of sending unmanned, rocket-equipped assassin aircraft into sovereign countries, or of eavesdropping, surveillance and unwarranted data collection. Husband and wife team, Terry and Belinda Kilby, are seeking to change that. Terry, the technologist, and Belinda, the art teacher, merged their backgrounds to form Elevated Element, an experiment in using drones for artistic purposes. Using drones, they are able to capture views of architecture and landscapes that would not otherwise be possible, operating in "the sweet spot above a crane and below a plane." They have been featured in a growing list of media, including CBS Sunday Morning and National Geographic Traveler Magazine. 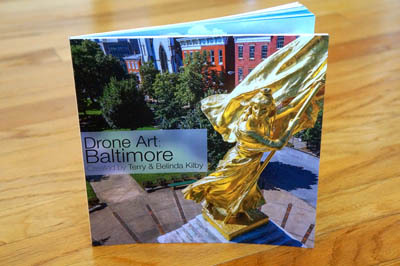 They have just published their first book, which chronicles their first few years of learning and refining their grasp of UAV and photographic technology and their artistic approaches. This volume contains images mostly in and around their native Baltimore city. As a fellow Baltimore native and resident for over 30 years, it is interesting to see iconic landmarks and scenes from this new, unique perspective.